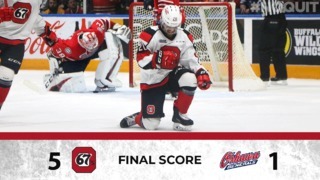 The Ottawa 67’s will look to get back into the win column this weekend with a pair of games inside the friendly confines of the Arena at TD Place. Despite a tough road trip last weekend that saw Ottawa pick up a single point in an overtime loss to Flint, the Barber Poles are looking forward to returning home where they are already 1-0 this season. Up first for Ottawa is a date with the Peterborough Petes on Friday night. 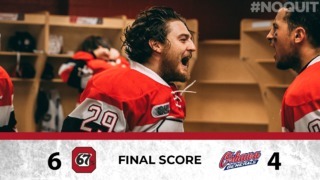 A long time 67’s rival, Ottawa will be looking for some measure of revenge after a tough season series against the Petes last year. The Petes are 2-2 so far this season. The 67’s close out the weekend schedule on Sunday when they host the Flint Firebirds, who are a perfect 3-0 to start the season. Ottawa lost both meetings with the Firebirds last year, including one in overtime and lost to then in overtime early this season. On last weekend’s road trip: “We’re focused mostly on the process right now. Our team has to learn how to be consistent with the effort they give. Mentally, we made a few mistakes in a row and we paid for it. The 67’s seven power play goals on 28 opportunities (25 %) ranks them fourth in the OHL. 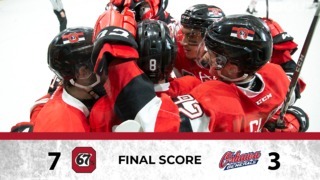 The 67’s went 3-for-6 on the powerplay during their home opener last weekend. Forward Austen Keating is leading the 67’s with four goals and six points in six games. 67’s captain Travis Barron and forward Sasha Chmelevski lead the team with 21 shots apiece, with Barron having played one fewer game. The 67’s head into the weekend tied with Hamilton for third in the East Division and three points behind Kingston for the conference lead.